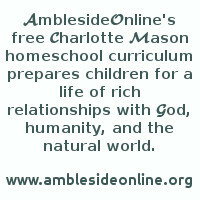 AmblesideOnline: What Year/Level Should I Place My Child? Question: "I'm new to CM, where should I place my 9 year old coming straight from public school?" I think getting started is the hardest part of using this program!! I agonized over which year to place my then 10 yo son and ended up doing a mish-mash (what you described as picking books where you think your child fit in) and I think it was a big mistake for us. We have been using this program since Spring of 2004 and love it (even with the placement mistakes I made initially). The advice you got is pretty solid -- some moms start at the beginning and others will place their children at grade level. There really is no right or wrong choice -- but you do need to be flexible and be willing to make corrections if it turns out that you started out at a level that was too advanced for your child. Some children just do well no matter where you begin but for others they need to feel comfortable with the material and so starting a bit slower and at an easier level will make the transition smoother. My .02 would be to place your 9yo either in Year 1 or Year 3. The advantage of starting at Year 1 is that your child can progress through the program right from the beginning. You can also adjust up a bit if the reading is too easy by adding in some of the free reading books from Years 1-3. It is much easier to adjust up a level than to drop back one (our experience!) Also consider your time -- will you be reading all of the books to your 9yo or can some be read by your student?? Year 3 might require more of your time. I would also suggest you look at the booklists for Years 4-6. Do you think your 9yo will be ready to do most of his/her own reading the following year? If not, then start at a lower Year and take some time to brush up on reading. Another consideration is the fact that you are new to the CMason approach. Your child will need time to adjust to narrations, nature study, art/music study, etc. By starting at Year 1, you will have a more low-key school experience and will have time to add in the special studies listed on the website. Sometimes when you start at a higher level it makes it hard to fit everything in. It takes time to get into the swing of the program and also to develop the proper habits (of attention, etc.). Lastly, with regard to scheduling. There are a number of sample schedules in the AO Groups file sections. As far as time for each subject -- it will vary but most 6-9 yos should spend about 5-20 minutes on a subject (5 minutes for copywork/narration and 20 minutes on math). Most subjects will fall somewhere in between -- it will depend on how well your child reads, how quickly you can get him/her to settle down, etc. Grades do not necessarily correspond to levels. We started in Jan with our 11 yos in level 6 because he was in grade 6 and, although he's done relatively well, I should have probably started him in level 4 or 5 because there were a few subjects that we had to go back and pick up earlier reading material. We're starting our 8 yos in level one this summer. Some of the reading material will be easier for him, but that just means we can start level two earlier, in my opinion. Plus -- he's straight out of public school and I want to introduce him to the types of materials that are available (living books vs. workbooks). It might be best to print out several of the AO levels to get a feel for what your child will be studying and reading before making a final decision. You might also want to "try him out" with books from the library or online selections to see how well he responds to the different materials in each level before deciding on a final curriculum level. Just remember -- if you're starting -- be flexible. If something isn't working, then try something else. As far as I'm concerned, unless someone has advanced knowledge on CM-type education (which I'm far from being) and starts from year zero, there will be some false starts. We have been using AO for 1.5 years now and in that time I have seen the wisdom of many moms who choose to begin in a lower Year and take the program very slowly. They seem to have a much smoother introductory year, more success, and their children really come to love the CMason approach. **Strive to have your children reading most of the books on their own by Year 4. If you think you will still need to read most of the books to your kids by this level, then you might want to slow down and let them catch up to the reading material. **It is much easier to start in a lower Year and then adjust upwards than it is to begin higher up and have to drop down one or more Years. This is especially true with this program as the history follows a 6-year rotation. It is very difficult to switch years mid-stream without losing the continuity of the history/literature cycle. **Pay close attention to the upper years of HEO (7-12th). This is really important for parents of children ages 10-12. There is a HUGE difference between AO Year 6 and HEO Year 7 in both subject matter and the volume of work assigned to the student. The advisory has created a Pre-Year 7 reading list as a supplemental to help parents prepare their children for the challenges of HEO. It is always a good idea to take a look at the two programs JUST so that you know what will be expected of your child when they get to 7th grade. Plan for that now by evaluating your child's reading skills (knowing of course that their skills will improve with this program) so that you will be prepared. Lastly, and I can say this from experience, that there is no harm done by choosing a Year you think will fit your children's abilities and your family life-style. We've made a number of mistakes on placement (starting too high and having to backtrack) and while I wish I would have done things differently, my son has enjoyed the program and greatly improved his skills. So really, there is no right or wrong with this program -- but it does seem to prove less challenging when you start it off slowly and take your time learning how to do it correctly (meaning how to implement Charlotte Mason's techniques). "Where should I place my 11 year old and 14 year old? Should I start them in Year 1"
Year 1 is going to be way too easy for the older children. I would do pre-year 7 or year seven for the 14 year old (I used it this year for a 14 year old and a 16 year old -- second year homeschooling for the 14 year old and first year for the 16 year old). We read some of the pre-7 books over the summer) and year 4 for the 11 year old (or maybe year 3 if the 11 year old has trouble reading, being independent, or so on). I would start now reading some of the books, working on narrations, and get an idea if these suggestions are the right ones. Most of the literature are classics and in your libaray or online, so you can test some books out for level without spending a fortune. I did year 2 (beefed up) this year with my 11 year old and it was way too easy. We did do Shakespeare and some poetry from year 7, but I still had to give her much more than in year 2. Year 2 was fine for my third grader. "As a new AO mom, and a new homeschooling mother, I am struggling with the decision of where to place my two older children." My response is in reference to how members use the AO web page itself. I personally believe anyone who takes the time to subscribe, and read the volume of posts generated by this loop is SERIOUS about the education of their child!! The email loop is an incredible resource of wisdom and insight; and I would hope that everyone here feels the freedom to ask their questions and express their opinions. I'm guessing that nearly all of us on this loop have asked advice on where to start, or how to start AO. I've been on this loop for a few years, and I see the same type of questions on a regular basis. But more than that, in my local CM group, and other homeschool groups in which I do "CM consultations"; I see how newbies view the AO web page. They look at it and assume that AO year equals public school grade. No matter how hard I stress to someone that this isn't true, they still have this "preconceived idea" they are equivalent. You see, the AO site is so frequently referenced at my house that it's my HOME PAGE for my internet. If you view the AO page, across the top of the page is a listing of all the AO years lined up 1-12 . . . just perfectly lined up to make the assumption that year = grade if you are unfamiliar with CM and AO. This seems to be especially true for those who are pulling their children out of PS and placing them in the AO curriculum. The very ones for which this assumption is the most dangerous! Imagine this scenario: You are changing from public school (or even a textbook HS), and think that because Susie was bored or not challenged enough with the PS materials; you mistakenly assume you can put Susie on the same year as PS grade (or even a grade above!) -- even though you are told the levels are advanced. But Susie wasn't ready for it . . .
Then poor little Susie is overwhelmed by a myriad of changes all at once! She's dealing with learning to homeschool, a LITERATURE rather than textbook approach, and literature that is MUCH more challenging than what she is used to reading. So, little Susie does the only thing open to her. She rebels! She hates homeschool! It can be a perfect NIGHTMARE for MOM and Susie! Mom gets discouraged and overwhelmed - especially if she's not well-versed in the CM philosophy - and they either change to a different type of homeschool or they quit homeschooling altogether. An AO dropout is born . . . and not only AO but they are usually a CM dropout, too. Since I believe so wholeheartedly that the CM approach is the absolute BEST approach for homeschool, it just breaks my heart to see the AO/CM dropout! I strongly encourage all CM Moms to use the AO curriculum, at least in part, because it's such an invaluable resource and lightens the already busy CM Mom's homeschool load! As I stated in my previous post, I think the AO curriculum itself is UNSURPASSED in excellence. But, in my experience, the year = grade correlation can be a severe hindrance to a newbie. I'd encourage a newbie to ask advise on the AO loop, read the AO posts, look at the books, and carefully and prayerfully consider the year to place the child. Ask questions and don't assume that AO year = public school grade. The year = grade correlation has potential difficulties associated with it for newbies, especially those transitioning from textbooks to the CM philosophy, OR those working with LD [learning disabled] children. But I guess, in a way, that's exactly WHY I wrote this post in the first place -- because I don't want others to be "turned away" from AO or CM. "Might a child who is academically gifted still benefit from pondering the concepts brought out in AO's books from earlier Years/Levels?" This is an excellent point. I have found this to be very true with my 11 year old son who was tested formally and labelled as 'gifted' before leaving the public school system. In my opinion, every child is 'gifted' and I do not like labels at all, so I try not to use them with my son. He is very bright and was working one/two grade levels ahead in public school (4th grader doing 5th/6th grade work). When we brought him home, I had a difficult time placing him in AO because of his advanced skills (reading and language mostly). I have written ad nauseum on our plight but suffice it to say that the most challenging aspect is as you point out, his lack of maturity when it comes to the subject matter. Skill-wise, he could probably do just about any AO year I chose, but would he really grasp the material? I think not. This is why we are lingering one more year with AO (Years 1-6) before moving up to HEO (AO for Years 7 through high school). I think it is always wise to start slower, take your time through the books, and enjoy the process. Maturity is a blessed thing (most parents are told that the process of maturity is something to fear, with all the hormones and problems associated with the teen years) as I see it, it is the most fascinating time, when our children's minds begin to change and grow and they begin to develop those pathways that will enable them to think, to speak, and to study as an adult. "Do you think that harder and more work for a gifted child might not benefit them, but might make them bored with learning?" Yes, yes, yes . . . this is the public school model for working with gifted children. Rather than give them work that is engaging and exciting, they just give them more of the same or harder work, hoping to keep their inquisitive minds from always asking 'why?' My son was treated exactly the same way and by giving him work two grades above his social level, his teachers hoped he would stop interrupting class, stop helping his friends with their work, and just generally sit down and be quiet. The funny thing is that my son is not the noisy type LOL! He is pretty quiet and studious normally and so it was just so anti-typical to hear them tell me that he was causing all these problems. Anyway, in reference to AO, my heart says to moms just beginning to really take things slowly. The program is so beautifully written that no matter what Year you choose to place your child, they will gain tremendous benefit from the readings and the process of learning.